The lobby of NorthBay Medical Center in Fairfield became Santa’s workshop for an afternoon on Dec. 20, giving scores of local children a chance to visit with the jolly old elf, glue and color Christmas ornaments and decorations, play interactive games and pick out a toy. It was all part of NorthBay Healthcare’s annual party for the families associated with the ABC (A Baby’s Coming) Clinic, which serves under-insured pregnant women in the area. “I think our volunteers and employees get as much fun out of this as the kids do,” said a cheerful Diane Harris, director of the ABC Program, who wore her red reindeer antlers complete with jingle bells while shepherding children up to meet Santa. Her team of “holiday assistants” escorted the children through Santa’s workshop, helping them pick out a toy, donated by NorthBay Healthcare employees. 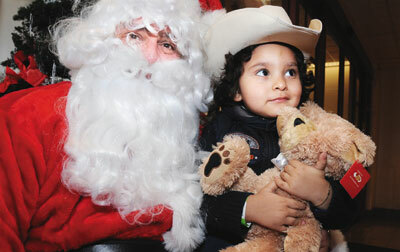 Once again, NorthBay Healthcare teamed up with Genentech to bring Santa Claus to the lobby for a special visit. Genentech also provided a plush teddy bear for every child, which it has done since the event began in 2002.